Today’s dressgasm is truly spectacular. Ordinarily, I am not that attracted to dresses of the early twentieth century but this dress is antique, yet it looks like it could be worn today. Call me crazy but I would wear this dress to the Oscars or something. 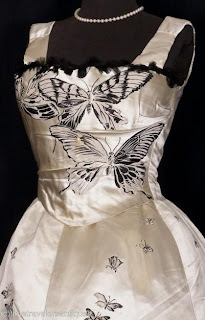 This dress was found on eBay and I believe the listing said it was from circa 1909. It’s a formal gown made of what appears to me to be ivory satin but it might be silk too. There are beautiful black and white butterfly appliques of varying sizes that trail down the full skirt. I have not seen a dress of this period that was sleeveless, so my theory is that the dress might have been altered later to fit future fashion standards. It might not be altered, though. I’m quite unfamiliar with the fashion standards of the 1890 – 1920 period. 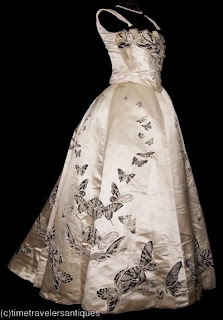 The lady who wore this dress was probably young and unmarried due to the fresh and youthful color and design. The sleeveless bodice suggests a fashion forward attitude that an older matronly woman might not have been willing to adopt. There is a bit of a train on this dress as well. She might have worn it to a formal dinner with little to no dancing, or she was an excellent dancer and wore it to a ball with no fear of tripping on it. In either case, the young lady surely made a sensation in this butterfly dress.